'First Avenue' (Barry Blyth, R. 2011). Seedling# Q20-1. TB, height 40" (102 cm), Midseason bloom. Standards amber yellow, slight violet flush at midrib; falls violet, 1/4" blended beige-grey edge, olive yellow hafts; beards white base tipped mustard yellow. Keppel seedling# 00-257K, 'Bollywood' sibling X (('Crystal Gazer' sibling x 'Poem Of Ecstasy') x 'Dance Recital'). Tempo Two 2011/2012. 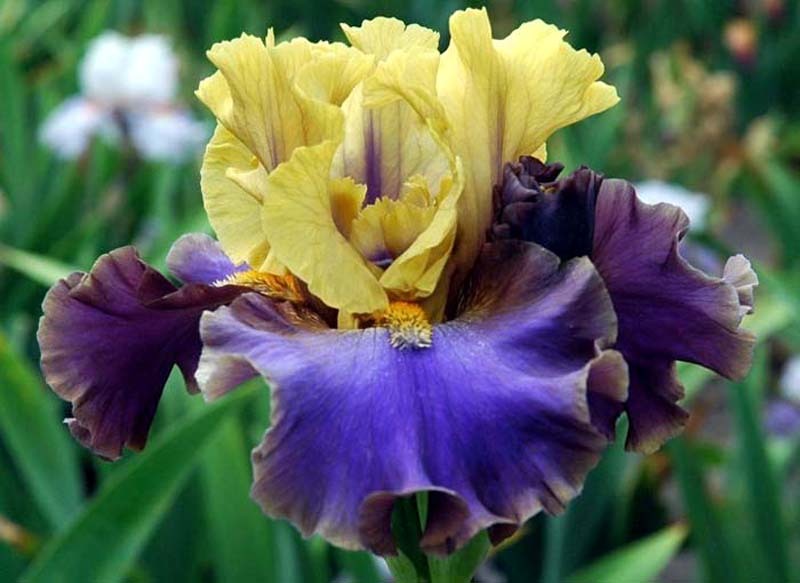 From Keith Keppel Iris catalog, 2011: FIRST AVENUE M 40" (Bollywood sib X (French Lilacs sib x Dance Recital)). Amber yellow standards carry a slight violet midrib flush. Violet falls are beige grey at the margins, olive yellow on hafts, with mustard tipped beards. Generously waved and ruffled stylish form with flared falls. Good growth habits. #020-1. $60.00. Hybridizer's comment: We have loved this from the first day it bloomed. Standards are amber yellow with a slight violet flush at the midribs. Falls are violet with ¼" blended beige-grey edge and olive yellow hafts, Beards are white tipped mustard yellow. Magical form with billowing ruffles and fluting. Super branching and is proving to be a great parent. lt s mostly from Keppel blood lines. JPG FirstAvenue01.JPG manage 97 K 13 Mar 2016 - 15:52 Main.TLaurin Photo by Tara Perrenial Farm-Owen Sound,Ont.